It’s said that Princess Diana’s dress was replicated and on the market within hours of her Royal Wedding. And Princess Catherine’s big day today is no different. I just got an email from Donna Salyers, founder and CEO of Fabulous-Bridal and Fabulous-Furs. She told me that her bridal designer, Kristen Bolt, just designed a dress inspired by Kate’s to carry at Fabulous-Bridal. Here’s what her email said and below is the picture! So exciting! Reason for writing – At Fabulous-Bridal, the Royal Wedding has inspired us to do our own version of a dress fit for a princess . . . developed by our own in-house designer Kristen Bolt. Have attached a news release and sketch. Royal Wedding-inspired dress at Fabulous-Bridal. Click to enlarge. 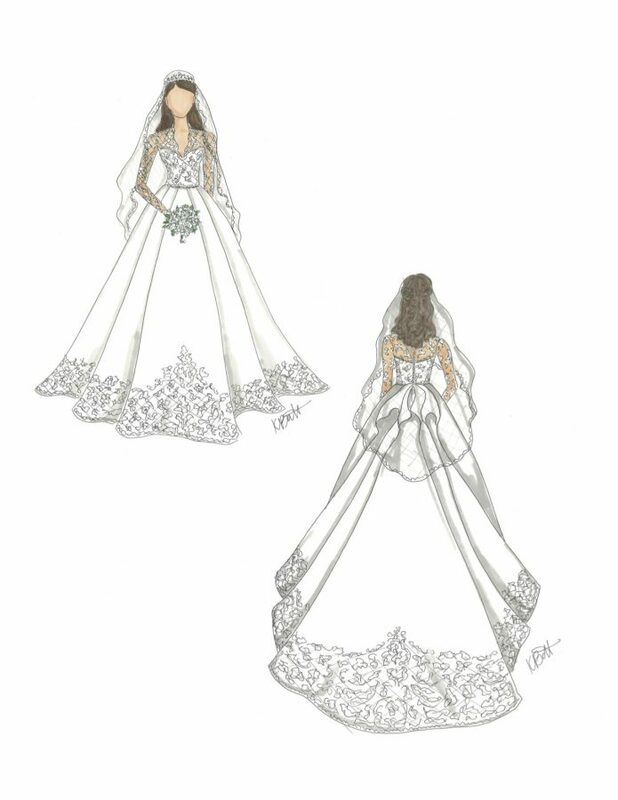 “The fitted lace bodice and sleeves, lace detail at the hem and a billowing train will be in demand,” confirms April Smith, General Manager at Donna Salyers’ Fabulous-Bridal. “But many brides will want detachable sleeves or a jacket that’s removed at the reception,” April continues. It’s so exciting that Cincinnati has the talent like Kristen’s and the mega-powerhouse-business-women like Donna who turned this around so quickly, and will be supplying what is sure to be an international demand now that Kate walked down the aisle in that beautiful dress. It exuded elegance and simplicity with a tinge of tradition. Love love loved it!